Contamination poses a significant risk to manufacturing processes and can escalate very quickly, which may result in product recalls, damaged reputation and loss of business. Contamination control practices are an essential element of working within Cleanroom environments and have never before been so vitally important to so many industries. SSE currently offer an interactive and very popular training course in Cleanroom and Contamination control. Create a core and thorough understanding of the impacts of Contamination within the Cleanroom. Create a fundamental awareness and understanding among personnel as to how they and their processes, behaviours, methods and practices, can contribute to Contamination within the Cleanroom and how these contamination levels can be prevented or minimised. Providing training for personnel performing the cleaning tasks within the Controlled Environment. Development of detailed cleaning schedule. Full onsite training provided to all staff backed up by video training resources. We work in partnership with our clients to create video training resources that are unique to their procedures. Prior to organising an in-house Training Programme, a Cleanroom Audit can be performed in order to examine specific problems / issues within the Cleanroom Environment. For example, Environmental Monitoring Trends, current Cleanroom Processes, Methods and Behaviours. This allows the tutor to further tailor the training programme to suit specific client requirements. The current level of GMP within the Cleanroom and supporting areas. 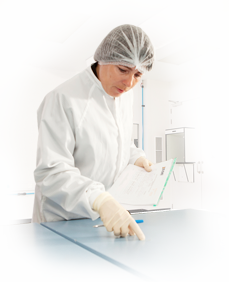 The Cleanliness and Housekeeping of the Cleanroom Environment. Effective Contamination Control Practices, Methods and Personal Behaviour. A detailed report featuring observations, suggestions and recommendations will be submitted to the client as to how the standard of GMP can be improved. Any suggestions or changes taken on board by the client can then be rolled out as part of the Training Programme. A follow up Audit can be performed after the training has been completed in order to review improvements in Contamination Control practices that have been put in place by the client and to offer further guidance and support as required.